Italian Greyhound Dog " "
What is more homely and welcoming to a home than your very own lap dog jumping on you and smothering you with licks and saliva? No other dog is easier to be around with and simpler to take care of than the Italian Greyhound dog. The not so distant relative of the original Greyhound dog, the Italian Greyhound is one of the best lap dogs to have around the house, provided, or course, that your home is not filled with small children. The Italian Greyhound dog is one of the best breeds of dog to have around and keep as a pet. From their medium-built frame, to their extremely thin coat which makes it easy to take care of, and their energetic and people-friendly temperament, the Italian Greyhound is a dog uniquely made for the lap, and is its own dog, not at all overshadowed by the breed in which it came from, the Greyhound. From puppyhood, the Italian Greyhound must be taken great care of, since it has really fragile bones for a dog. 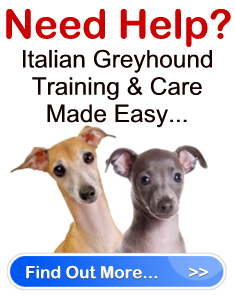 However, this meticulous care only needs to be done for the first 12 to 18 months of the Italian Greyhounds life, as after that time, this dog almost takes care of itself because of its ease of being taken care of. Also extremely sensitive to cold environments, whether it be an Italian Greyhound puppy or an adult, this breed of dog need to be extra coated when in cold environments, because of its already mentioned thin coating of fur and hair. They also prefer quiet, not-so-rowdy environments when it comes to households, so this dog is perfect, if you are single or are only a couple; small children might not know how fragile The Italian Greyhound dog might really be. Other than these small pet peeves, the Italian Greyhound is still an amazing dog overall. One of the best traits the Italian Greyhound received from the original Greyhound, was the exceptional speed. The Greyhound is considered to be the fastest breed of dog, with a top speed of 45 miles per hour. Although the Italian Greyhound is not that fast due to its relatively smaller built, it still has a top speed of over 25 miles per hour, 6 miles faster than the other breeds of dog. This, along with all the other traits the Italian Greyhound dog got from the Greyhound, along with its very own traits, make it a dog built for royalty.